The Catto Gallery is hosting a solo exhibition of recent paintings by Alain Bertrand, from 18th May until 5th June, 2008, to coincide with the UK launch of his new book ‘American Classic’ (price £25). This latest book is an illustrated overview of Alain’s recent work inspired by Cuba, New York, his tours through Middle America and the legends of Jazz. Alain will be signing his book on Sunday 18th May from 1:30 – 6:00pm at The Catto Gallery. This exhibition will have 30 of Alain Bertrand’s recent works in oil, with his moody nightclub scenes, redolent of post-war Havana, and his automobile portraits evocative of the American Dream, with prices starting from £5,950. In Bertrand’s American Dream series, the main focus of these works is the 1950’s automobiles and trucks. His work has a realistic quality, harking back to his past as a graphic designer and poster artist for such directors as Francis Ford Coppola and Steven Spielberg. His fascination with American automobiles –even his signature wouldn’t look out of place on a bonnet of 1950’s Oldsmobile, dates back to his childhood, where he grew up next to a post-war American air base in France. But it was in the 1970’s when he toured the States, particularly Arizona and New Mexico that his love for all things American solidified. Alain makes much of the play of light and shadow and nowhere is this more apparent with his nightclubs scenes, with ‘Buddy Guy’ and ‘Muddy Waters’ both on their guitars in an underground nightclub. Whereas the ‘Blues Trio’ – are portrayed all suited and booted jamming in a shack ready for their performance later on. It was in the 1980’s when he discovered Cuba and the jazz bars of Havana that his portraits and portrayals of jazz musicians and bar life began. Bertrand’s love of the motor car, which led him to design for Renault is evident in ‘Cliff House’ an evocation of the American Dream with a line of gleaming cars on the seafront, their bodywork and chrome shining with the Cliff House diner in the distance with it’s neon lit competing with the brewing stormclouds. This large canvas could easily be a still from a film. ‘Hi Dear Friend’ looks back to the New York of Eliot Ness, with the canvas in a series of blacks, whites and greys, to illustrate this New York street lined with gleaming cars, where these two friends greet each other. Bertrand’s time as comic illustrator for such magazines as Tintin, is shown to great advantage in this work. 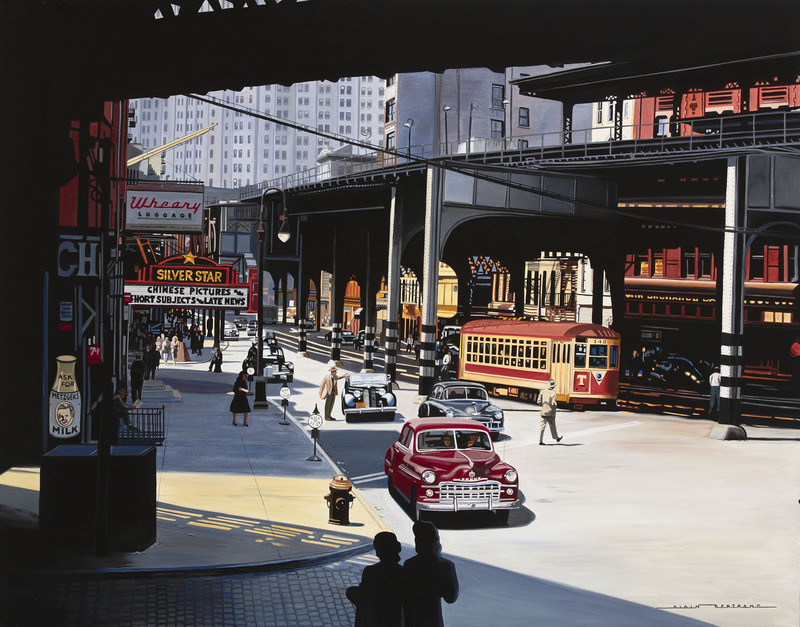 ‘Bowery Trolley’ is a cross section of everyday life in 50’s America where the cars add the glamour to this portrayal of downtown New York. ‘Duel in the Sun’ is a further portrayal of a New York street with the sun shining down in the recently fallen snow. The line of checker cabs draws the eye back to the skyscrapers of New York. Bertrand has a great eye for detail to make up this perfect ‘movie set’. These canvases although they look back to the heyday of the American Dream, should in no way be viewed solely a nostalgia trip; they celebrate the achievements of man through the internal combustion engine and the city. For further information, images and a catalogue of the forthcoming Alain Bertrand exhibition, contact The Catto Gallery, 100 Heath Street, Hampstead. Cassleton Elliott & Co. Ltd.
Alain was born near Paris in 1946. At an early age he was sent to a boarding school near Evreux. This isolation and its proximity to an American air base formed his tastes early in. Here he discovered Rock & Roll, Elvis Presley, cigarettes and most importantly the American Car. After his time in National Service, he worked for Renault for 11 years; while he was there he painted mostly cars and began to sell his drawings to comic books including Tintin, and Pilote. It was in 1976 that he first went to USA and it was from then on that his paintings were devoted solely to recording life in the States. He has traveled all over the States, particularly in Arizona and New Mexico where he ‘searched’ for the traces of the American Dream and rolling rusty scrap of cars and trucks littered across the desert. In 1979 Alain collaborated with Alain Marouani of the ‘Barclay Records’ in the creation of many record covers including 11 albums for Eddy Mitchell. During this period he also worked with Francis Ford Coppola on the creation of the poster of ‘Coup de Coeur’. Other graphic work included the creation of the poster for the film ‘Y t’il un Francais dans le Salle’; the poster for the film ‘Mommy Dearest’ with Faye Dunaway. He also worked in the States on ad campaigns for such clients as New York Telephone, Atari, and Cherokee Jeeps. Between 1982 – 1990 he formed Bahamas a group of illustrators with Patric and Christian Larue, who worked on many national ad campaigns including Darty, Roussel, Renault, Peugeot and Mars. This group showed their individual work at the exhibition of illustrators at L’espace Austerlitz in Paris in 1984 and 1985 winning the prize Marker d’Argent’ awarded by Mecanorma. The Catto Gallery is one of London’s leading contemporary fine art galleries. Since founding the Gallery in 1986, Gillian Catto has built up a reputation for excellence and has created a friendly and warm environment for collectors throughout the world. The Catto Gallery represents over 50 internationally acclaimed artists all of whom can be seen on this web site. 12 exhibitions are held a year; the catalogues for these exhibitions can also be viewed on this web site. Monday to Saturday 10.00am to 6.00pm, Sunday 2.30pm to 6.00pm. Parking is available on the Gallery's forecourt and pay and display nearby. This press release was distributed by ResponseSource Press Release Wire on behalf of Cassleton Elliott in the following categories: Men's Interest, Entertainment & Arts, Leisure & Hobbies, Motoring, for more information visit https://pressreleasewire.responsesource.com/about.